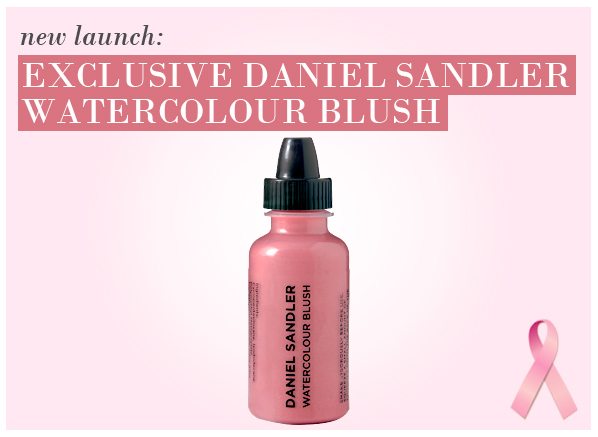 In support of Breast Cancer Awareness Week, Daniel Sandler has created a very special limited edition shade of his cult Watercolour Blush. The result is ‘Pop’, a wonderful watermelon shade that is described by Daniel as being his most flattering yet, offering a real “pop” of colour that perks up all complexions beautifully. You’re left looking cute, energised and as fresh as a daisy! The liquid blush is exceptionally easy to apply, with a super pliable silicone base that adheres to the skin and provides vibrant, long-lasting colour. The fluid provides skin with a dewy glow that looks so very natural, and is buildable so that you have maximum control over the intensity of your blush. £5 from the sale of each blush is being donated directly to Macmillan Cancer Support, the largest cancer care and support charity in the UK. One in three of us will develop cancer in the course of our lifetime, and that number is growing every day. Macmillan provides incredible assistance every step of the way for all people affected by the disease; not only for sufferers, but for their family and friends, too. The Macmillan team fights the corner of all of those who need their help, and to keep on providing that exceptional support system Macmillan welcomes volunteers, fundraising initiatives and donations. Find out more here: Macmillan Cancer Support. I was so pleased with how affective this liquid blush was. I'd only ever tried powder or cream blushes before and didn't really know what to expect form this product . I decided to give it a try and i was amazed !! the colour pay off is super and it gives a natural flush to the checks. The delivery was really quick to . This entry was posted on Tuesday, September 27th, 2011 at 8:17 am and is filed under Make-up. You can follow any responses to this entry through the RSS 2.0 feed. You can skip to the end and leave a response. Pinging is currently not allowed.